Philippine Permanent Representative to the United Nations Ambassador Teodoro L. Locsin, Jr. discusses the Philippine advocacy on religious tolerance at a high-level panel discussion on “Freedom from Persecution” organized by the Permanent Mission of Hungary to the UN on the margins of the 73rd UNGA in New York. The event was organized by the Permanent Mission of Hungary to the United Nations. 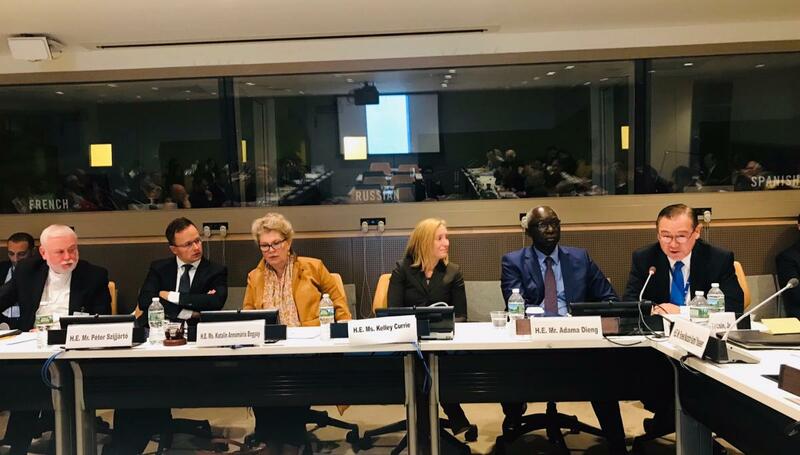 28 September 2018, New York City – The Philippines called for tolerance and acceptance of religious minorities during the high-level panel on “Freedom from Persecution: Christian Religious Minorities, Religious Pluralism in Danger,” convened today by the Permanent of Hungary to the United Nations on the margins of the 73rd Session of the UN General Assembly in New York. “The Philippines has pioneered and taken the lead by a mile for religious tolerance. It has signed one compact after another. But there must be an end to agreements and a beginning of action. The violence of evil can only be defeated by the forces of good,” Ambassador Locsin said. “Meanwhile the extinction of ancient Christian communities continues in the birthplace of Christianity; those which had the closest contact with its teachings and rites in their original purity. When Christianity is so diluted that it doesn’t feel Christian anymore, there will be no Christians left in the desolate places—from whom we might learn how far we strayed from the path trod by the Savior and His Apostles in their time upon this earth,” Ambassador Locsin said. Six other high-profile panelists joined the discussion, namely H.E. Mr. Peter Szijjarto, Minister of Foreign Affairs and Trade of Hungary; H.E. Ms. Nikki R. Haley, Permanent Representative of the United States to the UN; H.E. Archbishop Paul Richard Gallagher, Secretary for Relations with States of the Holy See; H.E. Mr. Adama Dieng, UN Under-Secretary-General, Special Adviser on the Prevention of Genocide; H.E. Mr. Ghady Khoury, Director of Political and Consular Affairs, Ministry of Foreign Affairs and Emigrants of Lebanon; and H.E. Mr. Fareed Mustafa Yasseen, Ambassador of the Republic of Iraq to the U.S. The high-level panel discussion aimed to identify gaps in the protection and development efforts for Christian communities in the Middle East and share policy frameworks, specific programs and initiatives tailored to protect the human rights of minorities, and ensure their freedom of religion and belief as well as full inclusion in society. Since 2004, the Philippines, in partnership with Pakistan, has sponsored an annual resolution on “Promotion of interreligious and intercultural dialogue, understanding and cooperation for peace” under the General Assembly’s Culture of Peace agenda.